What would you do if the Book of Mormon was not yet available in your native language? You would stage a pageant so the powerful messages in this divine book could communicate to your family and friends. That is precisely the situation the Karen and Karenni Latter-day Saints in Salt Lake's Columbus Branch find themselves in. 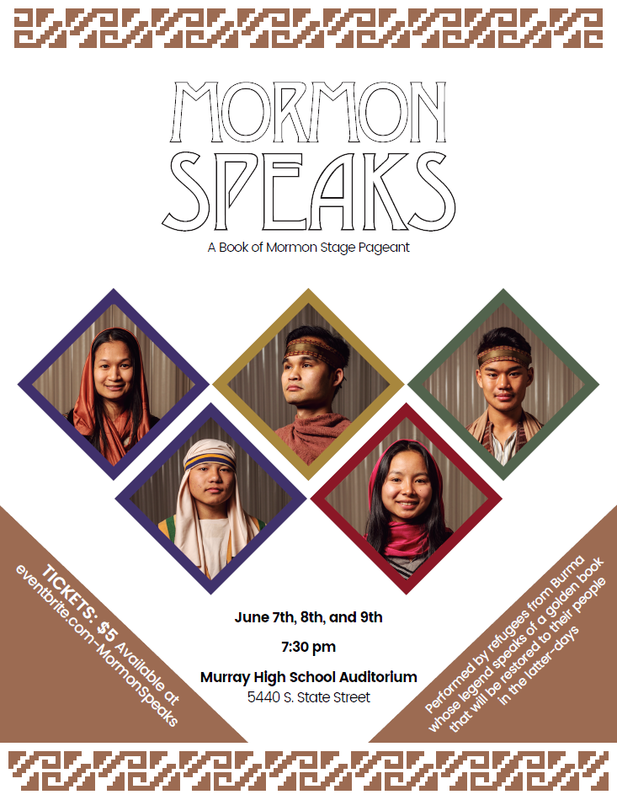 Refugees from Burma (Myanmar), they have come to Utah and joined the Church, but the Book of Mormon has not been translated into either Karen or Karenni so not all of their family members and friends have access to it. Enter humanitarians Bob and Susan Roylance who have been working with the Columbus Branch for so many years some of their neighbors in Murray hardly know them. See the article "Refugee Eagle Scouts" for background on the Roylances. Their family non-profit is called "Welcome Hand" which provides a variety of services to the Utah refugee community. Years ago, Susan authored a Book of Mormon pageant called "Mormon Speaks." It has been produced several times, but not in the last 20 years. She recently received the impression that she was to produce it again, casting Columbus Branch members in most of the roles. 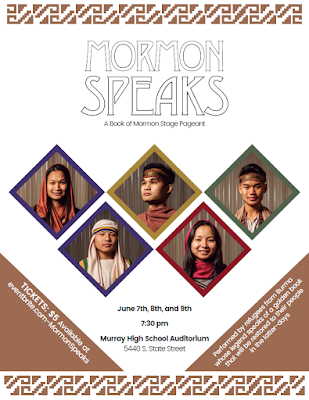 And that is how "Mormon Speaks" came to be scheduled for Thursday, June 7, 2018 through Saturday, June 9, 2018 in the Murray High School Auditorium, 5440 South State Street in Murray, Utah. General admission tickets are $5 and you can click on this link to purchase them on Eventbrite. Groups of 20 or more such as Young Men and Young Women get in free of charge. Click on this link to download a single page PDF flyer for printing or sharing. Bob and Susan's leadership will ensure good production values, but the real joy of this pageant will not be the impressive scenery, costumes, lighting, or props. It will be the spirit of wonderful Latter-day Saints, many of them recently-baptized, portraying the epic Book of Mormon story on stage for people they love.